Mountains are the only other environments, apart from polar regions, where organisms are exposed to permanent snow and ice. Temperature decreases with increasing altitude due to the thinning of the atmosphere. The air is warmed by the transfer of energy from the sun. As it becomes thinner with increasing altitude, there is less air to absorb this energy and hence it is colder. The temperature decreases by an average of 6.5 °C for every 1000 metre increase in altitude. The decrease in temperature results in permanent snow cover even on mountains at the equator, such as Mount Kenya in East Africa and Cotopaxi in the Ecuadorian Andes. You can even ski on the snowfields of Mauna Kea in the Hawaiian Islands. By forcing moving air to ascend, mountains cause it to lose its moisture in the form of rain and other forms of precipitation. Most of this falls on the lower slopes and the air at high altitude is thus very dry. The low moisture content of the air, and the lack of dust and other particles, means the air is very clear. This allows the passage of high levels of solar radiation, particularly ultraviolet radiation. The thin air does not absorb much of this radiation, but the ground does, resulting in marked differences in air and ground temperatures. The ground loses its heat rapidly at night and there are thus wide variations in temperature between day and night. Since there is less contact between the air and the ground, winds reach high speeds on mountain tops. This contributes to high rates of evaporation and to low temperatures. The thin atmosphere at high altitudes also poses oxygen-supply problems for organisms. The severity of the mountain environment increases with increasing altitude and several distinct zones can be recognised. Mountains are found throughout the world, however, and conditions will vary according to how close they are to the equator or poles and to oceans. In temperate regions, the lower slopes may be covered in deciduous forest, followed by a zone of coniferous forest. The treeline, above which trees do not grow, corresponds to where average temperatures in the warmest month of the year are below 10°C - the same conditions which determine the location of the treeline bordering the Arctic. Above the treeline is alpine grassland or tundra which is bordered at a higher altitude by the snowline. The tops of high mountains are so cold and windswept that there is little life associated with them. Apart from the occasional climber, the only life to be found may be insects, birds and microorganisms blown there from lower altitudes. Lower down, the snow may be tinged green or pink by the presence of snow algae. These have a mobile stage in their life cycle which enables them to migrate through the snow to a level where they receive enough light for photosynthesis, but remain below the surface where they are protected against the extreme conditions. In the lowland forests of Central Europe, the surface of the snow is sometimes stained black by masses of springtails. Other insects and even earthworms and enchytraeids are found in among the snow. Bacteria have even been found beneath glaciers in the Swiss Alps, where their activity is responsible for eroding rocks. Productivity at high altitude is low and many of the organisms rely on material which is carried there from the lowlands. This material consists of organic matter, such as seeds, leaves, pollen grains, spiders and insects, usually dead and known collectively as aeolian (windborne) derelicts. The vegetation of alpine grasslands or tundra superficially resembles that found in the Arctic tundra. This is not surprising since they face some similar environmental challenges - strong winds, low temperatures, a short growing period and low moisture levels. The two environments are, however, different and alpine vegetation faces the additional hazards of high ultraviolet radiation and, in tropical areas particularly, wide daily fluctuations in temperature with freezing conditions during the night but heat during the day. Seasonal changes are small on tropical mountains, but, at high altitude, summer comes every day and winter every night. In the high valleys on the slopes of Mount Kenya, this has led to some peculiar adaptations (Figure 2.9). Giant lobelias and groundsels grow there, the latter looking like giant cabbages on trunks. A covering of hairs or dead leaves on these plants traps a layer of air which insulates the plant against temperature extremes. 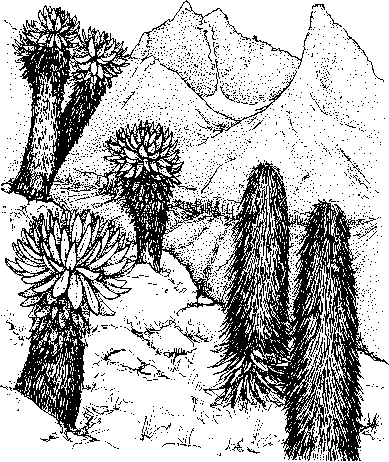 Giant plants, the frailejones and puya, are also found in the Andes of Bolivia and Peru. It is not known how their large size helps these plants to survive, but it must be related to the proximity of both these sites to the equator. Perhaps favourable growing conditions during the day at the equator enables them to reach a large size that helps them survive the cold during the night. Many alpine plants, however, are small and grow close to the ground. They have extensive root systems to anchor them against the wind. The leaves often form rosettes so that they do not shade each other from the sun. The production of a downy or woolly covering protects the plant against ultraviolet radiation (by reflecting it), retards water loss and provides thermal insulation. Protection is also provided by dried leaf bases and scales. The vegetation is often blue-green or yellow-green (rather than green) in colour which reflects harmful infra-red and ultraviolet radiation. figure 2.9 Giant lobelias and groundsels growing on Mt. Kenya. These plants grow to over 6 metres tall. Drawing by Jo Ogier. Alpine insects have many of the features observed in Arctic species. They are small and dark, can survive low temperatures and have a tendency to become wingless and to have protracted life cycles. Winglessness has developed for similar reasons to Arctic insects, but also because alpine insects are in particular danger of being blown away and deposited in an unsuitable habitat. Dark colouration may help protect the insect against the intense ultraviolet radiation and enable it to absorb heat to raise its temperature to a level where it can maintain activity. Insects may become encased in ice at high altitude, which can restrict their oxygen supply. A number of alpine species can survive periods of anoxia and can function without oxygen. Spiders and mites are the other main terrestrial invertebrates. Other invertebrates (flat-worms, nematodes, rotifers, molluscs and crustacea) are particularly associated with alpine lakes and streams. 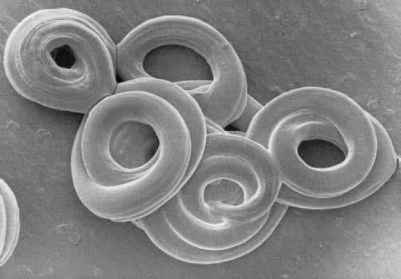 The small size of invertebrates helps them gain sufficient oxygen at high altitude despite the thin air. Mountaineers usually carry oxygen with them at altitudes above 6000 metres. Alpine mammals, however, have to ensure a sufficient supply of oxygen to their tissues by increasing the ability of their blood to carry oxygen. Vicuñas, relatives of the camel, have large numbers of small oxygen-carrying red blood cells. The blood of vicuñas has 13 million red blood cells per millilitre, compared with 5 million in humans, and their blood can carry about 25 per cent more oxygen than human blood. Alpine mammals are well insulated against the cold. Chinchillas, rodents from the Andes, produce the most dense and silky fur of any animal in the world and the coat of vicuñas is the most highly prized of wools. The large size of some animals from high altitudes, such as the yak, also helps them conserve heat.